Over the years, sixty-six men and women have lived with the legacy of the Iron Fist, of which Danny Rand is naturally the most recent. But what of those who came before, of their untold exploits and adventures? 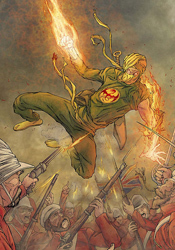 Well, for that, we've got Immortal Iron Fist, an ongoing document of the preceding sixty-five and the paths they tread during their years as the reigning champions of K'un L'un. This time, we're following the story of Bei Bang-Wen, who held the mantle for much of the mid-19th century. While many of his predecessors (and successors, for that matter) have relied on their powers to handle their problems physically, Bang-Wen was unique in that he was a more intellectual man, choosing to consider his actions at length before diving into the fray. The elder Iron Fist thinks highly of himself, particularly of his strategies in combat, and when he's finally defeated in a large-scale battle, that burden is extremely difficult for him to come to terms with. In Bang-Wen, writer Matt Fraction has brought to life a tragic character, unexpectedly stripped of his pride but not his life, which is in his mind twice as bad as a dishonorable death. This story is fascinating because it's more than just a look back at a character with identical powers to today's Iron Fist, swinging for the fences and KO'ing all the bad guys. In truth, Bang-Wen spends a great bulk of the issue isolated from his powers, which gives the reader a great chance to understand the personality and motivations behind such actions. It's easy to use a character's powers as a crutch, a device to drive the story in the place of natural development and good storytelling. In Immortal Iron Fist #15, Fraction proves that he can still spin a good yarn even without the aid of a blazing yellow fist and a killer flying kick. Khari Evans does a fine job of translating the mood and tone of Fraction's story to the page. I've seen Evans on several mid-level books at Marvel recently, and he seems to tailor his style ever so slightly to match the story he's telling. Here, his work takes on an expressive, animation-influenced quality that regularly jumps right off the page. When Bang-Wen and an ally sprint down a steep embankment to escape a fiery explosion, the haste and desperation of their actions are immediately evident, even though they're illustrated as simple silhouettes. Evans can do a lot with a minimum of linework, and this issue is his playground to do just that. It's hard to think of this issue as a part of the Iron Fist mythos, which is a good thing. It opens up a lot of fresh potential, on which writer Matt Fraction capitalizes. This reads like an old Chinese fantasy, for better and for worse, and that's not something you'll typically find on the shelves from a major publisher. While it does occasionally get caught up in a bit more narration than it really needs, the basic plot is easy to follow and entertaining. Although it's a continuation of an earlier story, I found the issue easy to jump into as a fresh reader and enjoyable from start to finish. It's not perfect, but it's worth borrowing at the very least, with a serious consideration towards buying.